The Side Effects of Vectra 3D Flea Treatment: Is It Safe? Fleas are a common nuisance that affects our pets and infest our homes, making topical preventives vital to ensuring the comfort and well-being of your animal. Though there are many products available to defend your dog from fleas, many offer no such protection against other common insects that threaten your pet. Ticks, mosquitoes, mites, biting flies can all cause discomfort to dogs or can even act as a potential source of infection. Vectra 3D for Dogs is one topical preventive that works to combat all of these pests. The unique formulation of dinotefuran, permethrin, and pyriproxyfen kills insects as they land on your pet. The insecticides and adulticide repel certain bugs while paralyzing and killing others on contact; the pyriproxyfen, an insect growth regulator, prevents the development of early stages of fleas to ensure that the life cycle of these pesky parasites is broken. This fast-acting preventive works to reduce the number of ticks significantly in the first 24-hours while killing fleas within the first two hours of administration; furthermore, a single dose offers protection from these pests for a full month. Vectra 3D is also available in four formulas to ensure that there is an appropriate dosage available for dogs of all sizes. All preventives which use insecticides should be administered carefully to reduce possible side effects. In order to help owners identify and reduce the side effects associated with Vectra 3D, we've put together this guide to help you better understand the product. Knowing the risks associated with the ointment can also help identify Rocky Mountain Spotted Fever, Lyme disease, and other illnesses caused by vectors. Correctly using Vectra 3D for Dogs is essential to minimize adverse reactions. It's therefore important that prior to using this product, you read the directions carefully to ensure that you apply it correctly. Applying too much of the solution or applying the wrong formula for your pet can result in chemical burns on your pet’s skin at the site of the application. Applying the product in the wrong location may lead to your pet consuming the solution, which can cause serious complications. Aside from chemical burns at the site of application, the ointment might also cause restlessness and anxiety. This may be a direct result of the treatment or it may indicate irritation at the site to which it was applied. The treatment may also cause lethargy, panting, racing heart, loose stool, vomiting, fever, and excessive thirst. It's also extremely important that you ensure the formulation is not ingested by your pet and that it does not contact your pet's eyes. Additionally, Vectra 3D is toxic to cats. This means that cats should be separated from any dogs being treated with this product until the product has completely dried. Additionally, dogs and cats in these households should be observed to ensure that they do not lick the preventive while it is still wet. Lastly, it's imperative that use of Vectra 3D be limited to dogs and puppies that are at least 7 weeks of age. As the product is powerful, it is unsafe for use on dogs that are pregnant, nursing, debilitated, or elderly. Additionally, certain medications may not be compatible with Vectra 3D. Similarly, dogs with particular skin sensitivities such as pruritus may be unable to handle topical preventatives of this strength. 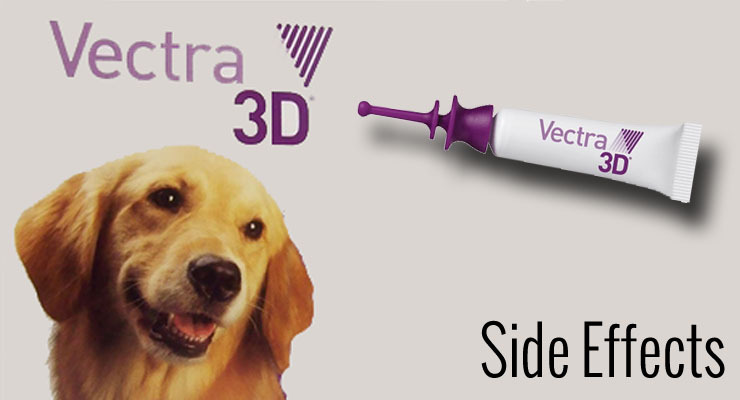 In the event that your dog experiences any of the side effects associated with Vectra 3D, it’s important that you wash off the ointment and call your veterinarian. To provide optimal relief, it’s essential that it be washed from your pet within the first 4 hours of application. A bath with colloidal shampoo or soap may provide relief after this period, but the majority of the treatment is absorbed within this period. If symptoms persist, talk to your veterinarian about providing secondary relief to treat your pet's specific problem. This can mean applying antibiotic spray or skin ointment for pets that are suffering from skin irritation. Symptoms caused by misuse should be treated with problem-specific protocols. If the solution enters your pet's eyes, rinse gently for up to 20 minutes and refer to the poison control center or a veterinarian for further guidance. Flea & Tick spot-on preventives for dogs continue to escalate in strength as insects become immune to common pesticides. Therefore, preventives for dogs often use ingredients that are too toxic to be used on cats and kittens. Though this toxicity is exactly what makes the medication so effective at killing ticks, lice, and other pests; cats may still require some protection from pests. For these felines and their owners, Vectra also produces a formula made specifically for cats. The formula works to kill all life stages of fleas with one simple topical that is safe for healthy kittens that are at least 8 weeks of age. This treatment is also available in two formulations for both small and large cats. Lastly, there is also a weaker formula available for dogs, Vectra for Dogs. This formula only works to kill and repel fleas- but is ideal for dogs that cannot handle Vectra 3D or for households with both dogs and cats.